In my school days (mid 1970s) I have observed cinema posters appearing on Wednesday night & on Thursdays ~ as new films would hit the screen on Friday (sentiment !) Slowly the culture permeated so deep that posters hailing 100th day – degenerated to 25 days and even successful opening. There were some hailing the audio release and pooja of proposed films even. Posters used to be the most preferred form of advertisement for political parties too – in some places, even death would be communicated through posters. 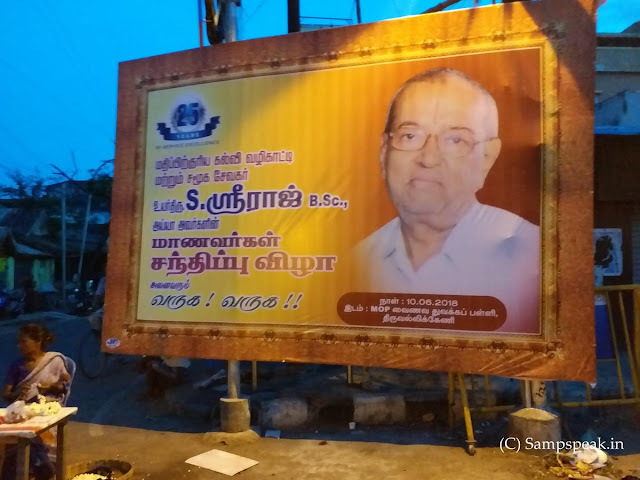 Now a days, one gets to see lot of flex-boards .. ..
yet, this one seen near V Illam Bus terminus was different – I was naturally attracted to it – as the person is well known to me (to most Triplicanites endeared by his service ) .. .. .. it is worth recapitulating what I had written in Bliss of Mar 2005 and posted in my blog on June 3, 2014 – in the series ‘Jewels of Triplicane’ – Sriraj, the man who taught kids ! 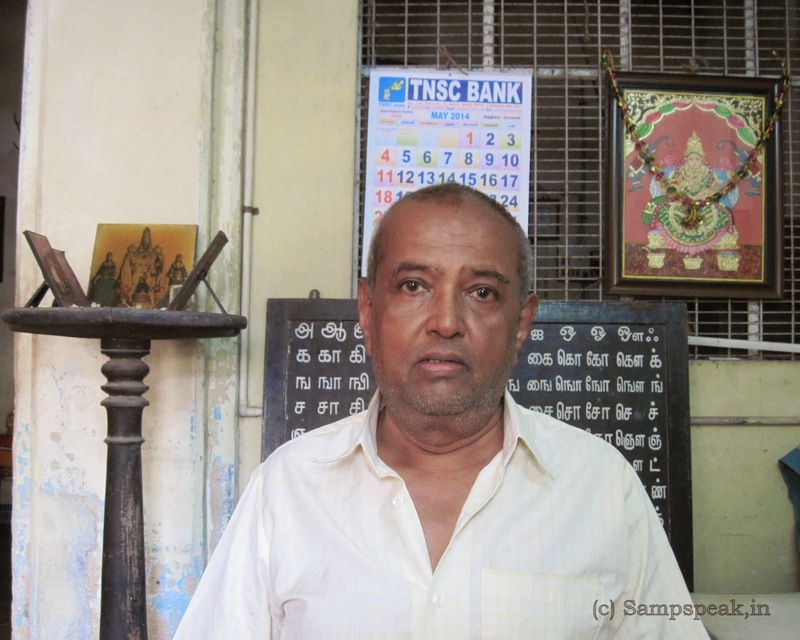 In Triplicane, the holy place with great heritage and rich legacy … many eminent Lawyers, great Doctors, Teachers and more importantly very responsible citizens have lived in this famed land, as you walk on the road, you might brush with very ordinary looking people, whom you may not cast your look for a second time…..but looks are deceptive – they could well be a great learned person contributing immensely to the Society …. Here is a person bent on eradicating illiteracy. He looks very simple and many of us would have seen him in the four streets around the temple, little realizing his greatness and his services. He may look like a very simple next door neighbour, I found him to be waxing eloquence and a true karmayogi. This is a small tribute to such unsung people. SYMA (and I) salute his indomitable spirit. SYMA honoured him with Seva Award in 2003.